The Saffron house historical Greek home and newly renovated with love and attention to the details. The house is originally 4 floors and we have nice size kitchen and dining area in the entrance floor and there is a beautiful lounge in the first floor with original ceiling and wall paintings. There are two bedrooms and two bathrooms next two floor. On top floor there is also perfect balcony gets sun all afternoon over looking to Golden Horn. This house is perfect place to taste of old Istanbul. You will be so close to all main touristic attractions as well as you will feel the real feel of turkish life. Once Little Greece of Old Istanbul now becoming one of the major attraction of local and international tourist. This area is famous with colourful houses and now where third generation coffee shops and art galaries are meeting with the old and traditional taste of turkish bakeries and local restaurants. There is full kitchen in the house for whom likes to cook in the evening. Owen, full size fridge, dish washer and washer / dryer is in the house. There are two air conditioning in the bedrooms for nice and comfortable sleep. You will have the whole house for your self and enjoy the beautiful facilities after your long day exploring our amazing city Istanbul. We use old and stylish furnitures and restored them the same way of the house and matching the colours of the house. There are many pieces coming from around the world during our travels and combination of old and new creates perfect place to live. Old and new facilities in the house are creating a great harmony to make you feel comfortable and relax at the same time. Your host's are local British/Turkish residents on hand to give any information or help if required. Peter is the designer and I am a young professional loving Istanbul and Balat this Unesco world Heritage sight, here in the heart of the Old City. Our passion is hospitality and welcoming guests from all over the world to this unique neighbourhood. Travel and going places fascinates us. What better than getting together with old and new friends and sharing travel stories from around the world!? So far we've collected stories from many countries and many cities visited from my wanderings on 5 continents! But all the places visited so far Istanbul I still rate my number one favorite place :) So please come and become our guest during your visit to Istanbul! We hope you will fall in love with our wonderful vibrant corner of Istanbul, as so many do when they come! Walk the historical streets. All unique, with so much character, some old, some in need of love and attention and many gloriously restored. On these cobbled streets, once the home of Istanbul's minorities, you'll see ancient Greek, Jewish, and Armenian homes and places of worship. This beautiful area, declared a world heritage sight by UNESCO, wonderful mixture of both traditional residents and newcomers living in their restored houses. The area, though in the heart of the city, has a vibrent “village feel” with its eclectic mixture of cultures, older residents, newcomers and visitors. On the edge of the more busy tourist area stay in a authentic neighbourhood and immerse yourself in the local culture,yet still have easy access by foot, or a 10 minute ride on local transportation to Aya Sofia, The Blue Mosque, Topkapi palace, the Grand Bazaar, Beyoglu Taxsim etc, and all of Istanbul's major attractions. On hilly cobbled streets, the twin neighbourhoods of Balat Fener were once the home of Istanbul's minorities. Here you'll see old Greek, Jewish, and Armenian homes, and some of the cities oldest Synagogues and Churches. The area, because of so many national treasures, was recently declared a world heritage sight by UNESCO and has a mixture of older more conservative residents and more modern new comers living in their restored houses. The area is loved by photographers and film makers so don't be surprised to come across film crews as you wander around. The street were you will stay was featured in the last Bond movie 'Sky fall'. Beautiful house, fascinating neighbourhood, attentive hosts. 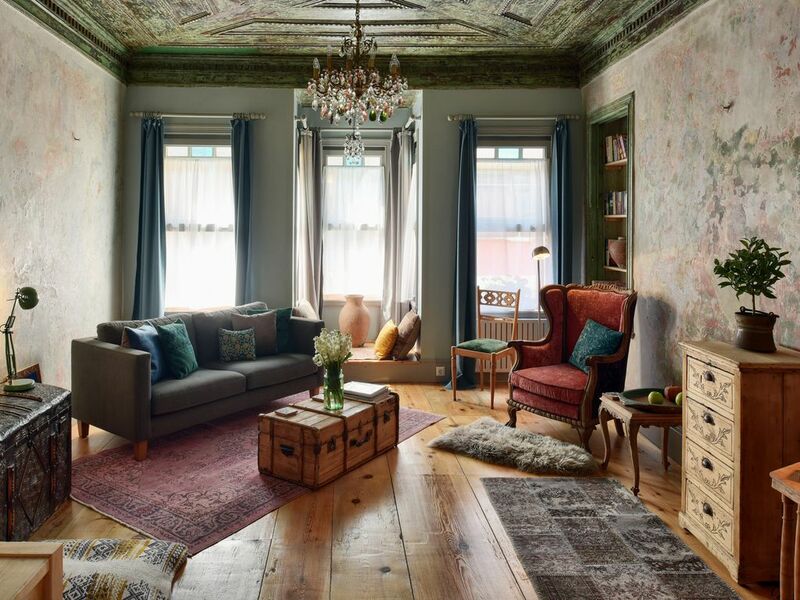 This is a wonderfully restored house on 4 floors in the historic neighbourhood of Balat. I very much doubt you will find a better home with such a good combination of modern amenities and old world charm, tastefully restored by Peter and Ozkan. Lovely furniture. Good wifi. Great books. Modern kitchen and bathrooms. Plus a roof terrace with a view to the Golden Horn where you can sit early or late to enjoy the vista. The house is set on a steep street between Balat (a mix of Bohemia and useful, everyday places to eat and shop) and Fatih (up the hill) which felt more conservative and Islamic. It's changing fast with houses being rebuilt and the roads repaired. You might call this gentrification or restoration. It felt safe and mixed as a place to live, which I liked, and coming from London it's incredibly cheap as an area. We were eating as a family of four for consistently less than fifteen pounds. And then you can indulge your sweet tooth endlessly...! So I'd very warmly recommend the house, the area and the city itself. If there is one downside it's the traffic getting from Balat to Eminonu and the main historic sites. They are building a Metro 10 minutes away but until then the bus often crawls into town or you jump in a taxi. But that's a small price to pay for a fabulous destination. Spent 2 weeks here. Could not have had a better time. If this place is free, book it! FYI...to get into town, take the 99 bus from down the hill, Fener stop, or the ferry runs on the '55s most days, Fener dock. Absolutely beautiful house, great everything. A pristinely restored 19th century house. The feel and charm of the Istanbul of old with modern appliances and other amenities and conveniences. Friendly neighborhood with easy access to restaurants and small markets. The proprietors were very helpful in recommending restaurants, must-visit sites, and in making sure that all was in order with the house and that we were comfortable. We loved walking though the old neighborhood. Never felt even the slighest bit unsafe even walking at night. The proximity to The Golden Horn and a main arterial road made getting around by Uber or Taxi very simple. We hope to return to Istanbul someday and look forward to staying once again in this house of beauty and comfort. Our week long stay in Saffron house was perfect. The house is a beautiful mix of modern and old and well equipped with everything we could ask for. The terrace has a stunning view and you can sit out there in the sun . The hosts were welcoming and generous with their time, supply is with milk, bread and fruit on arrival. The house is both a work of art and homely at the same time- ideal for a holiday away. Its an ideal city break, loads to do in the local area, great places to eat and friendly locals. I would highly recommend everyone a stay here! In the heart of Istanbul's old districts and on one of the 7 hills of the Old city, the area is changing as its ancient homes, churches, mosques and synagogues go through gentrification, guided by UNESCO and EU programs. On the edge of the more busy tourist area stay in a authentic neighbourhood and immerse yourself in the local culture,yet still have easy access by foot, or a 10 minute ride on local transportation to Aya Sofia, The Blue Mosque, Topkapi palace, the Grand Bazaar, Beyoglu Taksim etc, and all of Istanbul's major attractions. 55T goes to Taksim less than 10 minutes, 99 and 99A goes to Eminonü ( spice market) in 5 minutes. You can also walk to Halic metro station easily. On the Shores of the Golden Horn, it's only a 5 minute walk down the hill to the water and original Byzantine walls. The right choice for the discerning traveller. The area is loved by photographers and film makers so don't be surprised to come across film crews as you wander around. The street were you will stay was featured in the last Bond movie 'Sky fall'.